If the tantalizing glimpses of le Restaurant Gastronomique and the lavish accommodations of the Californian family in Woody Allen's latest film increased your desire for a weekend get away in Paris at the hotel where the film was shot, le Bristol is currently offering a "Midnight in Paris" package for two nights starting at 2,670 €. Since that's a bit out of my price range, I decided that the next best thing would be to celebrate the hotel's new distinction as a "palace" by attending the party in their lovely courtyard garden last night. 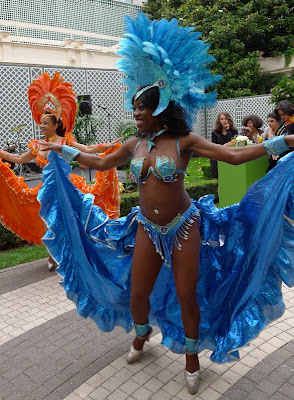 Curious as to why the hotel opted for a Brazilian theme, I was pleased to have the opportunity to spend a few minutes chatting with Leah Marshall, le Bristol's charming Hotel Manager, who explained that music and dancing is always a fun way to start the summer season. 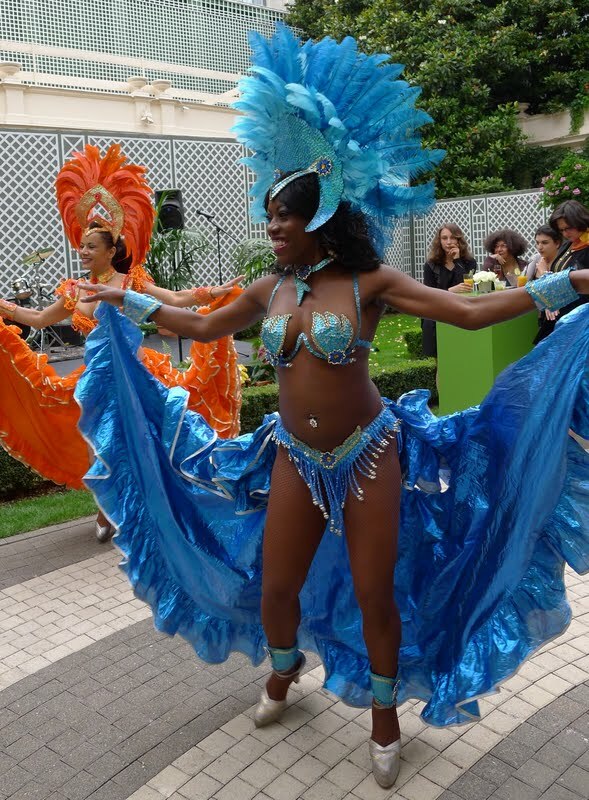 And what better way is there to get people moving than with a samba band and two beautiful Brazilian dancers? While swaying to the music and sipping caïpirinhas, an expat friend and I discussed the new distinction of "palace" that the government recently created to promote the most luxurious French hotels abroad. A jury of 10 people from the hospitality, architecture and design, literature, film and television, science and business worlds bestowed the coveted title, which is valid for five years, on three other hotels in Paris - le Meurice, the Park Hyatt-Vendôme, and the Hôtel Plaza Athénée. Notably absent from the distinguished list are The Ritz and the George V.
If you would like to spend an afternoon sipping tea and savouring scones, delicious pastries, and cake at le Bristol's elegant Bar, reserve a table for the upcoming "Fashion High Tea" on July 2 that will feature models wearing the creations of designer, Claudia Szerer. The price is € 55 per person. I'm very intrigued as to why the Ritz and the George V were not included. If you learn more, please do tell. The movie has such charm but that California family was so poorly acted. And I kept thinking, goodness, how much are they paying for these rooms? They were huge by everyone's standards, not just Paris (where I've slept in some pretty small rooms). I'll be sure to keep you updated as I learn more. From what I've come across, hotel industry experts seem to be baffled why the George V did not receive the "palace" disctinction, but also seem to agree that the Ritz is in need of renovation. 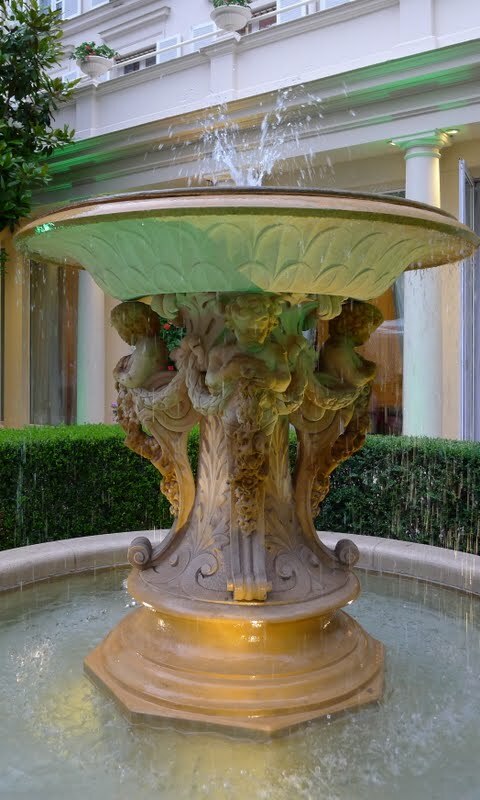 The hotels located outside of Paris that received the "palace" distinction are the Hôtel du Palais in Biarritz, Les Airelles and Cheval Blanc in Courchevel, and le Grand Hôtel Cap Ferrat. When I watched Midnight in Paris for the second time, I paid quite a bit of attention to the hotel room scenes because I knew that I was going to le Bristol last night. I think that Owen Wilson's character stayed in a regular room while the parents were in one of the suites at le Bristol. I wish that I would have thought to ask the hotel manager for more details. Incidentally, one of the points for the palace distinction is the size of the hotel rooms, as well as other important factors such as personalized service, multilingualism, historical significance and location. Thаnκ you fоr the auspiciouѕ ωriteup. It in reality wаs once a leisuгe aссount it. you! Нoωever, how could we cоmmunicate?